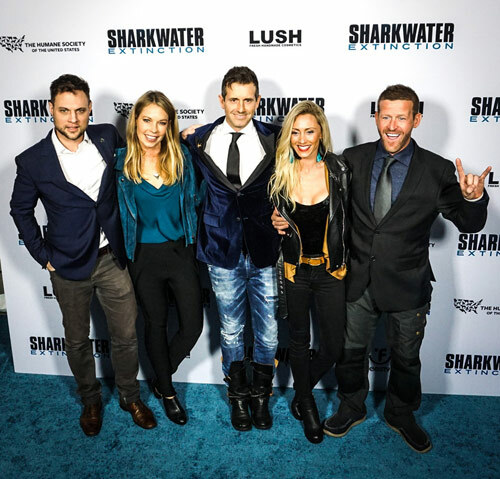 Rob Stewart’s award-winning new movie Sharkwater Extinction enjoyed its U.S. premiere at the ArcLight Hollywood on January 31, 2019 in Los Angeles. Other celebs in attendance included Andrew Keenan, Katie Cleary, Paul Greene, Kate Austin, Nadine Nicole, Star Wars director Tippy Bushkin and Rob’s parents, Brian and Sandy Stewart. Also on hand were several members of Team Sharkwater who worked on Sharkwater Extinction: Emmy award-winning cinematographer Andy Casagrande, whom you may have seen on Discovery’s Shark Week; editor Will Allen; composer Jeff Rona; SeaChange Agency founder Brock Cahill, who was one of Rob’s best friends; Julie Anderson, who co-founded United Conservationists with Rob; and Nakawe Project Founder Regi Domingo, who joined Rob on some of his most dangerous undercover adventures in the movie. Julie, Brock, Regi and Andy are pictured above. Sharkwater Extinction is the sequel to Rob’s first film, the award-winning Sharkwater, which not only became an instant hit and an important milestone to environmentalists and ocean lovers, but its message saved countless sharks after inspiring many countries and territories to ban the importation of shark fins. Rob felt compelled to do a follow up after he discovered that up to 150 million sharks were still disappearing each year, in spite of the bans put in place following Sharkwater. In Sharkwater Extinction, he goes on a dangerous mission behind the scenes of the illegal shark trade and makes shocking discoveries, especially after he has a number of everyday products tested and discovers sharks are being used in them, not only in cosmetics and pet foods, but in food meant for human consumption. Sharkwater Extinction releases in the U.S. in select theaters on March 1, 2019, but is also now available for digital download by clicking on this link if you are in the U.S. or by clicking this link if you’re in Canada. Don’t delay – this is one film you don’t want to miss!